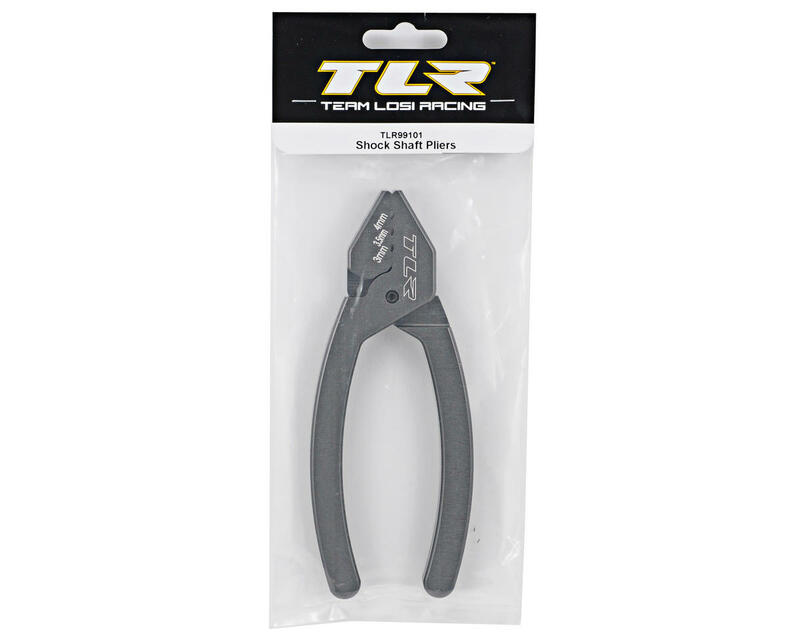 This is a set of Team Losi Racing Shock Shaft Pliers. 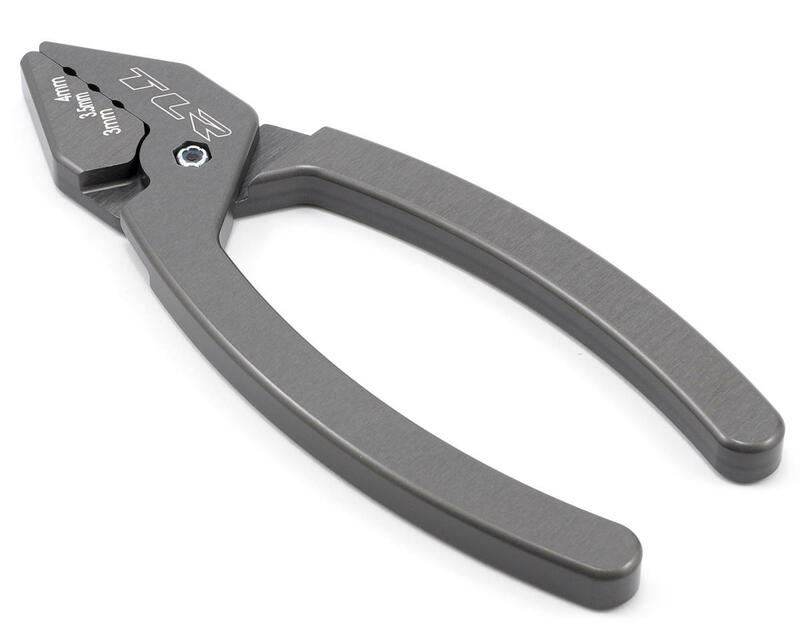 These hard-anodized pliers can be used to hold shock shafts in sizes 1/8th inch, 3.0mm, 3.5mm, and 4mm. On 1/8 scale buggy / truggy... yes it does hold the shaft so you can screw on the plastic ball end and is a lot better than trying to hold the shaft with a sock and pliers, but you do have to squeeze pretty hard the further in you screw the ends. Unfortunately, the handle is not ergonomic at all. If it was more comfortable, 5 stars. Since its really uncomfortable, but effective, 3 stars. Good tool, makes working with your shocks much easier. The only downside is that it isn't all that comfortable to hold if you are using for a while. If you re-build your shocks often, or you have 2 or more cars, I'd recommend placing some rubber tubing over the arms. This is one of those tools that may seem unnecessary and a little expensive, but once you get them, you're like, "Why didn't I get these sooner". I just used these for the first time and they saved me a ton of headaches. The shocks on my Durango ST have a screw that holds the piston in and I had it loctited in to prevent it from backing out (which had happened to me). I had to change shock pistons and I was a little worried that I would not be able to get a good enough grip on the shaft to get the screw out, but these pliers made it easy...with little effort I was able to break the loctite and get the screws out. VERY happy with this purchase!! Better than STRC, cost a little more, but you get what you pay for. These will completely lock down the shaft, they are on the large side, but the extra mass and size is what ensures you get a solid grip. Just received my new pliers in the mail yesterday and promptly built the shocks on my 22T 2.0. These pliers work exceptionally well, they hold tight and do not damage the finish on the shafts. I should have purchased these years ago. The pliers are very well made and have a very nice finish on them. A very nice product from TLR and well worth the money. this one tool for RC enthusiast will never regret to have on their toolboxes! it will never make you fail if you assembling or re-building your shocks! it's the perfect shock pliers will never damage the shaft and it will take care of it with "tlc"! also a multi function plier! can use as ball pusher for turnbuckles! Losi done it again! that's why i'm collecting all Losi tools! you will never have a downfall on it's usefulness and quality of product! L O S I all the way!!! These pliers work great but sometimes due to their large size it can be hard to get a good grip on the shafts especially the 4mm shafts (and I am a big guy too). I think this is a must for someone who builds shocks or turnbuckles very often. It will save your hands and fingers and well as the ball cups and turnbuckles. This is a great tool I wish I had 10 years ago. It easily holds the shock shaft secure without slipping. For the last number of years I've been using pliers and a rag to hold the shafts. Usually it worked okay, but I would get the occasional slip and scratch the shaft. Build quality of these pliers are very high and they have a great fit and finish. Are they too expensive? If you look at the price of high quality tools at a hardware store I think the price is right where it should be. Well worth the purchase. I used this to replace my shock shafts with the titanium coated ones. I did not have to struggle with a needle nose pliers and potentially scratch the coating. Top notch quality! These are a must have tool for a serious RC racer. I cannot believe I didn't buy one of these sooner. I wonder why I put off getting a pair for so long. I can't say that these are better than others but I can say they work perfectly. I have needed this tool for soooo long that it will probably be my favorite tool . Great tool. Makes shock rebuilds a breeze. No scratching your shock shafts. Gave them a four star because they are a little pricier than the others while doing the same thing. +1...easily the best shock shaft pliers on the market. Very comfortable and the large handles allow you to apply enough power so that the shock shafts do not rotate in the jaws. Absolutely love this wrench, really lets you get a good grip on the shock shafts. Its larger than you would guess by the pictures, and very high quality.